Pepper North brings you a new age play series! The Magic of Twelve will share the stories of twelve women transported on their 22nd birthday to a new life as the droblin (cherished Little one) of a Sorcerer of Bairn. These magicians are much older and physically larger than the woman linked to them at her conception as their destined one. It is the sorcerers' pleasure to take complete care of all their needs. A deep voice came from the arched doorway to her right. “I wondered when you would arrive. It is 7:23. One minute after your birth, twenty-two years ago.” She twisted her neck quickly to look at him. He was massive - at least seven feet tall with a wide chest and shoulders. A black beard and mustache covered the lower third of his face. His black shiny hair was braided intricately down the back of his head and the tail of the braid lay thick and heavy over his shoulder. Dangling from his left ear was a polished, intricate steel earring. “Ummmm, I’m not sure where I am. There must have been some mistake. I know this is going to sound crazy, but I just touched the surface of my old mirror and . . .” Violet attempted to explain. “And you fell through the mirror landing here in my study,” he completed easily. “Welcome to your new life,” he said dryly. 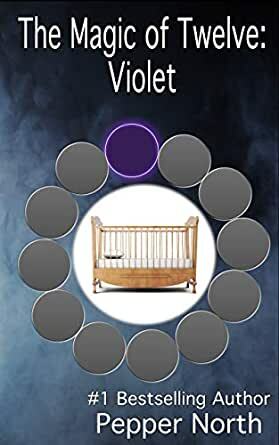 “I have been waiting for you to become an adult and come to me for many years, Violet. Now, let’s get you settled in,” the man began as he waved his hand in an intricate pattern through the air. With a casual wave of his hand, her arms straightened and froze by her sides. “Your old clothes are no longer necessary for you. You’re not in Atlanta anymore. Here, I decide what you wear or don’t wear.” He flicked his fingers and her bra and underwear disappeared. Another new and amazing series from Pepper. For those who love Age play this book as well as the others she writes stand out from all the rest and make us sad that there is no age play matchmaker and that we don't have mummies or daddies like they Little's do. Interesting new world to explore with some interesting twists that I’ve come to expect from this author. The storyline provides an emotional connection with the characters and makes the fantasy come to life in a realistic and believable fashion. A complete story with enough hints of things to come to keep you hooked. If this is the pilot episode, I’m signing up for the season. Fast, fun, read. Loved it, at first Violet was scared & then when she talked with the other little girl, she realized it was ok, & then found her Daddy. Can't wait to see the next book. I really enjoyed this fantasy. I don’t usually go for the “alien”, but this was different!! I look forward to reading the other books in the series! I love the Dr Richards books and I hope there are many more! Thank you for writing, they are great! 4.0 out of 5 starsGood but not Great! Not as good as the Dr. Richards' series. I will still read the series, but so far not as impressed as her other series. Please do not skip this book because of my review. This is just one person's opinion. 5.0 out of 5 starsThis is a great series beginning. Great idea for a new series. I really enjoyed this book, and am looking forward to the next story. It was a complete story on its' own (not a cliffhanger) but still leads to more books.